In our continued coverage of the 12 character types that began in the article Does YOUR Brand Take a Stand? – the Archetypes, we have already looked at 3 of the 12. Now, we turn our attention to our fourth character type – The Conqueror. Is this the archetype of your brand? 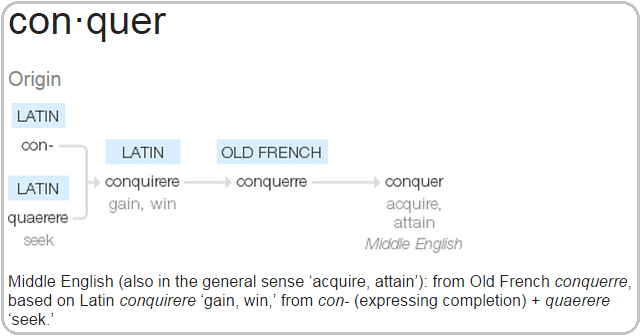 As shown in the image below, the etymology of the word conquer suggests that it literally means “complete a search”. In modern day language, there are a variety of meanings and usages of this word. In the context of brand archetypes, to conquer means “to gain, win, or obtain by effort, personal appeal, etc.” OR “to gain a victory over; surmount; master; overcome”. The Hero, the Warrior, and the Champion are other names for the Conqueror. So, is YOUR brand “identified by an ability to meet and overcome adversity”? Does it believe in meeting challenges head on? Are its core values resilience, relentlessness and self-confidence? Does it take a stand for empowerment? What other well-known people and businesses are Conqueror brands? As a personal brand, are you a Conqueror? Business Owners: If YOUR brand is a Conqueror, please share what makes it so?